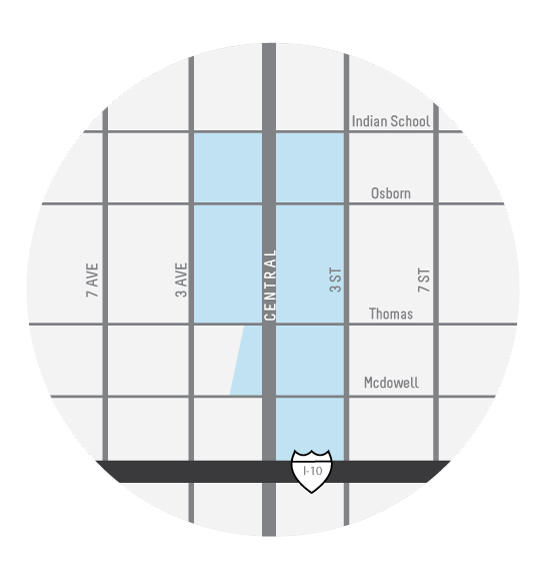 Midtown Neighborhood Association (MNA) began as the Midtown Museum District Neighborhood Association in 2008, initiated by a few tenacious residents of condominiums at Tapestry on Central, seeking greater City representation of their neighborhood. In 2015, the founders incorporated into a 501(c)3 with a mission to organize various social and information-sharing events that provide opportunities for neighbors in Midtown Phoenix to get to know each other. Critical to MNA is the promotion of neighborhood safety and Block Watch groups to reduce crime and vandalism. We partner with representatives of local government – Mayor’s office, City Council, Phoenix Police, Keep Phoenix Beautiful – and transportation purveyors like Valley Metro light rail, as well as Midtown parks, museums and cultural arts to achieve our mission. Our neighborhood is blessed with a variety of cultural and performing arts venues, excellent public transportation, accessible green spaces and well-preserved historic residential neighborhoods, as well as business and architectural support of our urban lifestyle. Meetings and hearings have been set for Rezoning Case No. Z-41-18, which requests a change in zoning for approximately 2.16 acres located at the northeast corner of 7th Street and Thomas Road (the "Property") from Parking P-1 District to R-5 Multi-Family Residence District and High­Rise HR District. The Property is currently part of an expansive surface parking lot which serves the Phoenix Country Club. Midtown Neighborhood Association with Downtown Voices Coalition and the Phoenix Downtown Neighborhood Alliance will co-present a mayoral debate this election season. In June, The Burton Barr Central Library reopened its original site at 1221 N Central Ave after nearly one year’s closure following extensive storm damage.